Luke Kuechly received some of the highest praise you can imagine from Tampa Bay Buccaneers offensive coordinator Dirk Koetter. You can’t give much higher praise than comparing someone to the likes of Tom Brady and Aaron Rodgers, right? Well, according to Andrew Astleford of ESPN, Tampa Bay Buccaneers offensive coordinator Dirk Koetter gave a rave review to Luke Kuechly. He went as far as comparing the star linebacker to the defensive version of Tom Brady or Aaron Rodgers. "He’s one of the top players in the NFL. He’s the Tom Brady, Aaron Rodgers of defense. You watch when he’s in there — the offense checks, he’s checking the defense, he’s sliding the front. The guy’s an impressive player. They’ve been a lot more vanilla the last 2½ games with him out. I’m sure as soon as he gets back, they’ll crank it up again and do more things than they’ve been doing." Koetter told ESPN. 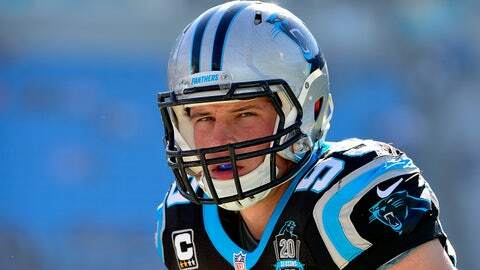 The praise didn’t stop there, as head coach Lovie Smith echoed similar praise about Kuechly. "Luke Kuechly is as good a mike linebacker as there is playing the game, if he’s able to go," Bucs coach Lovie Smith said. "I know he’s been out with an injury. You want to see great players in the league not be out because of injury. But if he chooses to not play this weekend, we’d be all right with that, too." Kuechly suffered a concussion in Week 1 and has missed the last two weeks of action. Fortunately for the Panthers, they’ve rallied without him and are looking to get to 4-0 this Sunday.